In improving cognition and functional outcomes in hospitalized geriatric patients, the Acute Care for the Elderly (ACE) model has proven its value. The difficulty is that there are so few ACE units and so many patients who could benefit but don't have access. Even in hospitals with an ACE unit, a geriatric patient's condition may require care in a different unit. Although age is a risk factor, younger patients in other units can also become disoriented and begin to lose physical function. 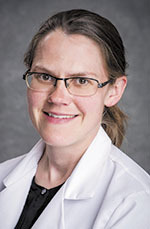 Katrina Booth MD, medical director of the ACE unit at UAB Hospital Highlands and her team understood the need for making ACE care available to more patients. The fastest approach would be to share what they have learned with other units. To find the best ways to do that, they launched a pilot study with two UAB medical surgical units that have a high population of patients over 65. "One unit was primarily orthopedic and the other was for patients treated by our hospitalists." Booth said. "From the start, we knew it would be important to engage all members of the care team and make sure they understood what we were trying to achieve. There was a lot of enthusiasm from the nurses and other staff members. "A big part of ACE involves training nurses to assess patients for risk factors for delirium and physical decline, then implement protocols to monitor and intervene. Our ACE team meets daily to discuss how a patient is doing from different aspects of care. When a problem may be developing, we discuss strategies to address it. We taught nurses in the pilot study how to use the same assessment and tracking tools we use and techniques for intervention. Something as simple as talking with patients and turning lights on and off to help them keep their days and nights straight can make a difference." One major problem that can occur is hospital-acquired delirium, which can be mistaken for dementia, leading to patients being discharged to a nursing home rather than to their own home. "When the brain is under stress from illness, being in an unfamiliar environment with sleep disruptions make it is easy to become disoriented," Booth said. "Age seems to reduce the brain's ability to cope with these stresses, but it can happen to anyone. "Delirium comes in different forms and some are easier to recognize than others. When a patient is agitated or picking at food that isn't there, you can see there is a problem. Quiet delirium is harder and may be mistaken for depression or fatigue. Patients may go silent and want to sleep all the time. This needs to be assessed." Some medications also make delirium a greater risk. "Opiates, muscle relaxers and side effects of other medication can cause confusion," Booth said. "We work with physicians and pharmacists to find alternatives for pain control. Tylenol, other basic pain relievers, topical creams, heat or cold, movement, and even listening to music can help." Another major target is getting patients up and as mobile as possible as soon as possible. Anyone who has been sick in bed knows it doesn't take long to start feeling sore and tired just from being in bed, and weak when you try to stand. "As soon as patients are able, we help them get their muscles moving and get them up and into a chair as soon as it is safe to head off other complications," Booth said. "We keep a walker in every room so they can take a few steps as soon as they are ready. We don't want their muscle to weaken in the hospital and start a cycle of decline." The pilot study for passing ACE tools, principles and interventions on to non-ACE units improved nurse assessment skills and patient outcomes. Patients seemed to maintain their cognitive clarity and made the move from bed to chair more quickly. Information gathered during the pilot study will be helpful in fine-tuning techniques for passing on virtual ACE intervention capabilities to other units and other hospitals. UAB Hospital Highland's ACE unit has shown this approach can reduce costs, length of stay, and readmissions. Patients recover faster and are more likely to return to their homes and their lives. Passing this skill set on can make a difference in many more lives.